The Austrian Federal Ministry of the Interior implemented NetApp and SafeNet security solutions to maximize data recovery, provide the highest possible encryption standards, centralize cryptographic keys and create a separation of powers. 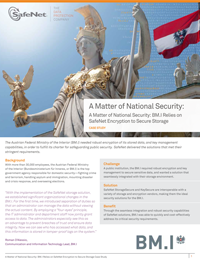 Learn more about this extensive and best-in-class security solution in “A Matter of National Security: BM.I Relies on SafeNet Encryption to Secure Storage”. Download and read this case study now.